In September 2017 the UK Government introduced 30 hours of free childcare for qualifying families. Find out how this has impacted working mothers – and the childcare industry. At the time I’d just bought my first house (with a dauntingly large mortgage) and was our household’s only breadwinner. My ex-husband had just been accepted on an apprenticeship scheme which paid virtually nothing, and my commute meant I was away from home from 6:30am to 8pm every day. However, I was lucky enough to be able to find a workable and affordable solution. My grandmother offered to care for my son for me (I went back to work when he was four months old, when my Statutory Maternity Allowance ended). And when he was old enough, my son went to a local playgroup during the day, subsidised by the Childcare Voucher Scheme. 16 years on, and I’d like to think that childcare in the UK had evolved to make returning to (let alone staying at) work more accessible for mothers. And yet, all the evidence says not. If anything, the situation appears to have become worse for many families. 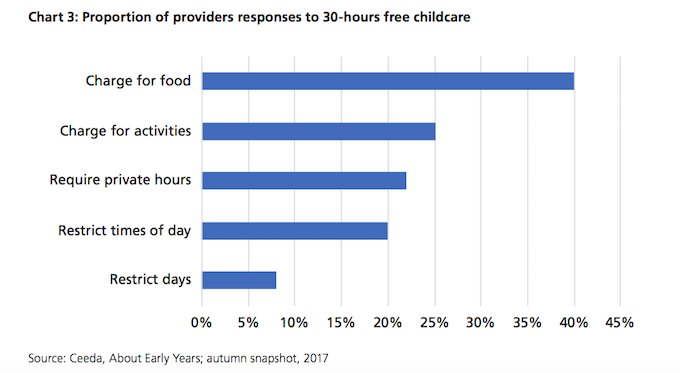 We decided to look at the current state of childcare in the UK, and how the new 30 hours of free childcare for qualifying families has impacted mothers – and the childcare industry. One big change to childcare this year has been the (in effect) closure of the Childcare Voucher Scheme. As of 4 October 2018, the Childcare Voucher Scheme closed for new entrants. And anyone changing their jobs after this date also loses their right to access it. Which means there will be a dwindling number of families able to take advantage of it. Still, there is some good news, right? In September last year the Government extended free childcare. This change meant that the three-and four-year old children of working parents in England were entitled to 30 hours a week of Government-funded early education and childcare during term time (38 weeks of the year). But this appears to be a case of giving with one hand and, unintentionally, taking away with the other. Why? Because the amount the Government gives to childcare providers to cover the free hours doesn’t; nurseries are complaining that they cannot offer childcare for that amount, leaving them losing money for every child who uses free hours. Nurseries, like any business, need to make money (or at the very least cover their costs) to survive. So the only way to absorb the loss they’re apparently making on the free hours, is to raise the costs for their paid hours, or recoup the shortfall by placing charges and restrictions on the funded hours. Which ultimately means that the biggest loser is mothers. Suddenly, a return to work (important not just to earn money for your family, but to retain your skills and confidence and for mental wellbeing) seems that much more out of reach. What other government childcare schemes are available? Tax-Free Childcare – qualifying parents are entitled to up to £500 every three months (£2,000 a year) for each child to help with the costs of childcare. The government pays £2 for every £8 a parent pays for childcare provision via an online account. Universal Credit – as part of Universal Credit, parents are entitled to up to 85% of childcare costs, up to a maximum of £175 per week for one child, or £300 per week for two or more children. Child Tax Credits – these are dependent on your number of children and income. Working Tax Credits – as part of Working Tax Credits, parents can claim extra to help cover the costs of approved childcare, up to 70% of childcare costs up to the same thresholds as for Universal Credit with additional funding for households on housing or council tax benefits. 15-hours of free childcare a week – qualifying parents are entitled to15-hours of free childcare a week (570 hours per year) for two-year-olds. To qualify you must be entitled to certain benefits. Support for parents in education – if you’re in further or full time education you can qualify for weekly payments through Care to Learn, Discretionary Learner Support to pay for childcare and a Childcare Grant to pay for childcare costs for children under 15 or under 17 if they have special needs. 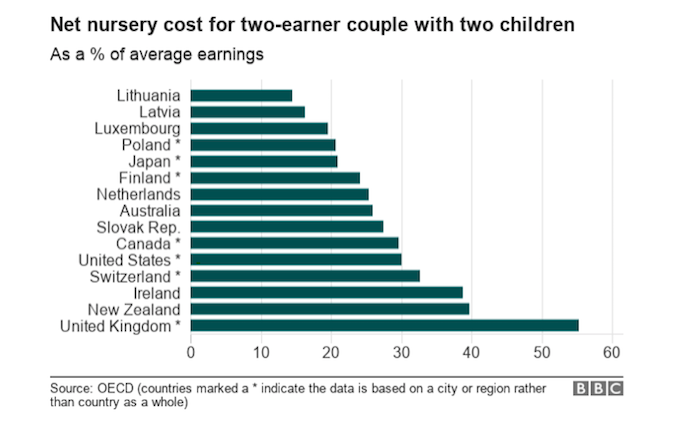 Yes, that shows that, on average, parents are paying a huge 53% of their earnings on childcare. The shortfall in funding appears to have led to some unintended consequences – and seen nurseries look for creative ways to ensure they can afford to run. One solution many childcare providers have resorted to, is to place charges and restrictions on their offer of free childcare. This means that only 46% of the places offered under the 30-hours entitlement are completely free. How have the changes to childcare affected you? Personally, we’re in a fortunate position. As business owners we’re able to choose the hours and location of our work. Which means we work during school hours in an office close to our homes, and from home during holidays and after school. We’re also able to enable the women who work for us the freedom and flexibility to choose their own working hours and location. But most mothers don’t have this luxury, especially mothers of pre-school children. They still depend on easily available and reasonably priced childcare. We reached out to our networks and asked mums across the UK how the changes to childcare – specifically the closure (in effect) of the Childcare Voucher Scheme and the new 30 hours of free childcare – had impacted them and the childcare they used. This is what they told us. “Whilst we are using [the Childcare Voucher System], realistically we feel like my husband can’t change jobs because we’d lose access. And, while it’s useful to have the extra child care time for free, there are lots of downsides – the application process, the codes, the real added stress its added to our child’s life (so much so that we are considering dropping it). It’s all frustrating, its all extra things to consider and work around. “My son is two in December and having applied for a nursery place (paid) in January I have been told they are oversubscribed for the January term. They explained to me that this is largely due to the free nursery funding as detailed in this article. “Our pre-school was about to close and the committee cited the 30 hours as the reason for this (the pre-school was only open 20 hours per week, so parents who had access to 30 hours funding were going elsewhere). As parents we got two weeks’ notice. A group of us formed a new committee and we’ve managed to turn it around in the face of other local pre-schools closing, but we don’t have the high overheads in that we operate from a village hall. Pre-schools are so important as they are typically more flexible than nurseries and because they do shorter sessions they’re usually more affordable too – it was the only childcare I could afford when I went self-employed (even though I could use the 15 hours, the top up fees were stupid at a nursery). “We were using the Childcare Voucher Scheme through my husband’s work, but I am self-employed so I wasn’t eligible. I was invited to be an early adopter to the tax free childcare system which has been fab – saves us so much and is easy to manage. Our child turns three in December, so I applied for the 30 hours this month. In fact actually the system pretty much did it for me when I reconfirmed as usual for the tax free childcare. I was sent a code instantly, passed it to nursery, and job done. I’m so grateful to be saving so much money from January, especially as I’ll be on maternity leave again soon, which as a self-employed person is very hard! The change to childcare has meant that I’m able to stay self-employed, doing what I enjoy, instead of needing to find a permanent role which would inevitably mean me commuting and being less present for my young family. “When my daughter was little I started my business in her nap times. It became clear by the time she was three that we needed nursery care for her. We qualified for the 30 hours but it was a really complex system. Being self-employed I had to re-apply every three months. This was fine except that it meant that I had to call the helpline – which invariably took up a fair amount of time. The people on the phone were incredibly helpful and I got the feeling that they wanted to give me the funding but had to go through the motions. I got used to it after a while and just came to accept the questions. I did find it incredibly stressful – and somewhat invasive – though as I felt like they could take the funding away from me at will (which they could!). We didn’t have a plan as to what we would do then, as we definitely couldn’t afford to send our daughter to nursery for 30 hours without the funding. My business was in its infancy and I desperately needed the funding to be able to grow the business. I didn’t honestly know the answers to many of the questions. When asked, ‘How much money are you expecting to make this year?’ I didn’t really know what to say. It was very hard. I had to guess! Our nursery couldn’t offer only 30 hours funded places, so they introduced ’top up fees’. This was to make it possible for the nursery to offer the same level of service that they had been doing, but also accommodate the 30 hours. The 30 hours funding simply wasn’t enough for them to run their nursery as they would like to. There were no state run places available where we live that were suitable as they were too far away. I’m incredibly grateful that we received the 30 hours funding but it was a very stressful (and expensive) time. I felt the system was badly organised and no one really knew the answers to several of my questions, although the staff were always helpful. “The childcare provision in this country is in crisis, and unfortunately I think it gets harder for working parents after nursery, when children go to school, and they have to deal with the 3pm pick up, inset days and long school holidays. More than 50% of parents can’t find after-school care within their local authority. I was working full time as an editor at Associated News and was totally stuck finding help with after-school childcare two days a week. I tried asking all my mum friends, I tried local childminders (they all wanted to finish at 6pm but I didn’t get home until 7.30pm (if I was lucky). And full time nannies weren’t interested in part time hours. I even tried put a postcard in the window of the local newsagent. Then I heard two students talking in my train station waiting room and I asked if they lived locally and if they were interested in any babysitting work. One of them, Louise, was and she ended up coming over to meet us all. We hired her and she was fantastic – an art foundation student so did amazing craft projects with the kids which were a treat for me to see when I got home. “We are a small group of three nurseries and school clubs in Wiltshire, and we are very keen to support anything that help make quality childcare more affordable to parents. But unfortunately the funding given by the government doesn’t match the funding we need to provide the quality childcare and education we give. We receive £4.14 an hour and our breakeven point is at least 70p more than this. Unfortunately this rate is fixed for the next two years like most small businesses our overheads will be increasing (living wage and business rates to name a couple). We always want to do what’s right and best for our families, and we don’t believe that parents who don’t receive the funding should pick up the difference for this shortfall, so we don’t pass on costs to them. We have lots of funded families in our settings and our parents are happy to pay the small consumables charges that we add on to cover freshly cooked meals, snacks and additional resources and facilities that we have in our settings to go above and beyond the basic requirement. I chair a networking group for providers in Wiltshire and Swindon and from our conversations I think that the majority of childcare providers manage by including these consumable charges. And most parents understand as they are still getting an invoice at the end of the month that is much less than if the funding wasn’t available. The administration of the funding is another layer of admin for us (and parents) to deal with, I want our managers to be out working with the staff and children not sat in the office completing paperwork so we have an admin officer to deal with the funding (and I have also stepped into take a role in this). As with other sectors, we are just asking the government for fairer funding to provide quality childcare to ALL children. I am passionate about providing quality childcare and a service parents and children deserve, and as well trained and motivated staff are the key to this I so spend a large amount on staff recruitment, pay, retention and training (for example, my aim is that all my staff have paediatric first aid training) and we are always sending staff on further training and development courses. “On a personal level the closure of the voucher scheme didn’t impact us as I am self-employed and my husband’s company didn’t have them. We use tax free childcare which does help (although I know that it depends on salaries). My biggest bugbear though are that nursery staff get paid crap wages. They aren’t valued and we left our first nursery because the turnover was so high. The staff were lovely but the stress and pressure they were under for a minimum wage job was too much. 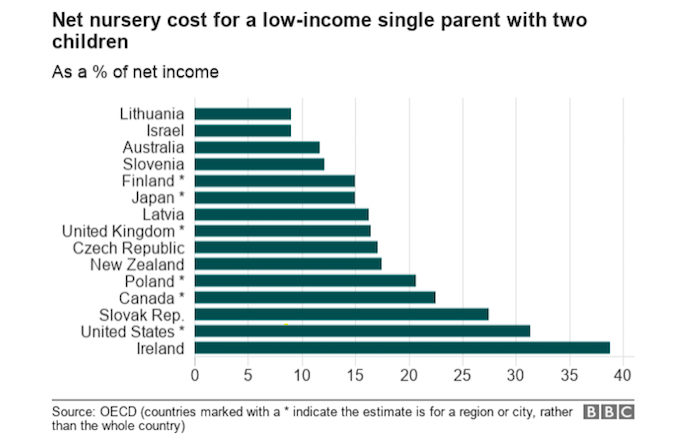 The government needs to start understanding that quality childcare and decent wages for staff is going to have a massive positive impact on the UK economy long term (and wellbeing). Our new nursery doesn’t accept the 30 hours; it’s Montessori and the staff are paid more. It’s good for us but obviously out of reach for other parents. I understand why they don’t accept them – it would mean cutting staff but it means some people have less choice. What’s your experience of childcare in the UK? Are you a parent or childcare provider in the UK? If so, what’s your experience of the current childcare provision? Have the recent changes affected you (positively or negatively)? We’d love to hear about your experience to build a bigger picture of the state of childcare today. We’d also love to hear of any suggestions you may have for improvements to the system, to make it fairer and more workable, both for parents and childcare providers.